Soba means buckwheat in Japanese. Although some versions of soba noodles contain wheat, you can find soba noodles made with just buckwheat flour. These noodles, used in both hot and cold dishes, look like spaghetti but have a nuttier flavor. Nutritionally these noodles are similar to spaghetti, but they offer some additional benefits. As far as calories go, Soba noodles have about the same number as spaghetti noodles -- 200 calories in a 2-ounce dry serving. If you eat 2,000 calories a day, a serving of soba noodles meets only 10 percent of your daily calorie needs. Most of the calories in the noodle comes from its carbohydrate content, which is 43 grams. Soba noodles are also low in fat with just 1 gram of fat per serving. Soba noodles are a good source of fiber. Noodles made with 100 percent buckwheat flour contain 3 grams of fiber per serving. On average, Americans get 15 grams of fiber per day, according to the Academy of Nutrition and Dietetics, and are not meeting their recommended needs of 25 to 38 grams per day. Getting more fiber in your diet from foods like soba noodles keeps you feeling full longer and can help you better manage your weight. 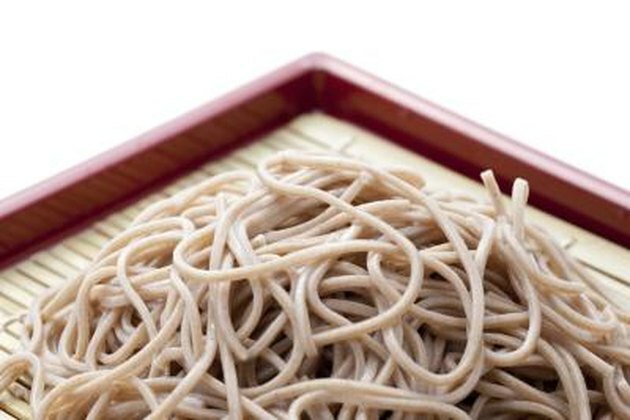 A 2-ounce serving of dry soba noodles contains 6 to 8 grams of protein. Although the amount of protein isn't that much different than that found in spaghetti noodles, soba noodles contain a higher-quality protein. Buckwheat is rich in lysine and has an amino acid score of 100, which is a very high amino acid score for a plant food, according to the Whole Grain Council. The protein in buckwheat, however, has a low digestibility and should not be relied on as your only source of protein. Soba noodles provide iron, calcium, phosphorus, magnesium, zinc and potassium. The noodles are especially high in phosphorus, meeting 20 percent of the daily value. Phosphorus is found in every cell in your body, but its primary role is to assist with the formation of bones and teeth.